San Francisco was rated one of the most dangerous places to walk in 2009 (even though it’s also one of WalkScore’s most walkable cities in the country). And while the city has done much to reverse that public image, there are still around 200 fatal an injurious pedestrian accidents in San Francisco every year—roughly 1 injury or death for every 4,000 people). And while some of those efforts have shown an effect on the total number of accident in the city, the number of fatal pedestrian accidents in San Francisco hasn’t really changed that much since 2014. It shouldn’t come as a surprise that crosswalks are among the most dangerous spots on city streets for people on foot. It’s in these supposed safe zones that people and cars come into close contact every minute of every day. It’s also here that impatient, distracted, or reckless drivers can change (or end) a life in the blink of an eye. All of which can have disastrous effects on pedestrians caught in a vehicles line of travel. In fact, 41% of all pedestrian accidents in San Francisco occur when a driver fails to yield to a pedestrian in a crosswalk. 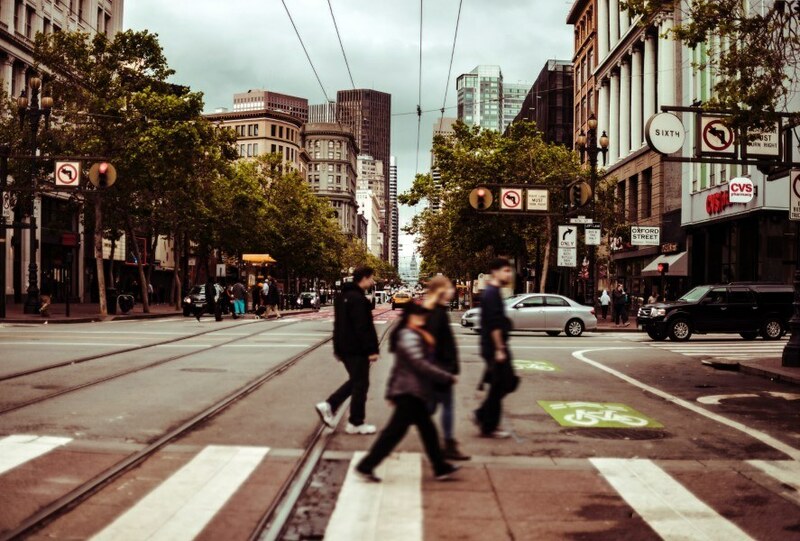 San Francisco’s Municipal Transportation Agency is looking for ways to decrease the risk to pedestrians in these danger zones throughout the city. In the past they’ve used pedestrian bump-outs, slow-zones, and redesigned traffic flow patterns to decrease the likelihood of a car/pedestrian collision. Now they’ve unveiled a not-so-new, simple-to-institute solution called Leading Pedestrian Intervals. Leading Pedestrian Intervals (or LPIS) can be used to effectively give foot traffic a head start over vehicular traffic at an intersection. What the SFMTA does is re-time crosswalk signals and stoplights so that pedestrian traffic is cleared to enter into the roadway at least three seconds before drivers are given a green light. This allows pedestrians to enter the crosswalk long before cars stopped at the signal are given the go-ahead—ostensibly making them more visible to the driver. While the SFMTA has been using LPIs for nearly twenty years, the organization’s commitment to Vision Zero has expedited their search for solutions to the pedestrian accident epidemic that’s gripped San Francisco since 2009 and LPI’s are one of the most cost-effective tools they can use. The overall goal of using LPIs at dangerous crosswalks in San Francisco is to decrease the number of collision, thus the number of injured individuals. And studies have shown that LPIs can do just that. In fact, on the SFMTA’s blog they cite a study conducted by the Transportation Research Board at Pennsylvania State University which shows similar LPI installation reduced pedestrian accidents by as much as 60%. Halving the number of pedestrian accidents in San Francisco at crosswalks could cut the total number of people struck by cars by almost 25% citywide. That would make a tremendous impact on street safety and save dozens of lives. Real-world application of San Francisco’s LPIs has shown some promising results already. There’s a new LPI in use at the intersection of Eddy and Mason streets and certain types of accidents there have decreased. In fact, the number of left-turn pedestrian collisions has decreased from 8 in 2015 to zero last year. Not every crosswalk is getting an LPI. San Francisco installed the first LPI in 1999. There were 60 installed in 2015 alone. However, to date the SFMTA is focusing solely on the high danger corridors within the city (streets and intersections were the number of fatal and injurious pedestrian accidents in San Francisco outpace all others). And not every intersection will see one either. Re-timing all of the signals in the city would lead to traffic jams—especially during rush hour commutes. Also, the LPI relies solely on the driver’s discretion. If drivers choose to run through stop signals or are distracted during a turn, they’re still likely to hit pedestrians. So until drivers treat those on foot like they own the road too (which they do) there will still be pedestrian accidents in San Francisco. If you’ve been seriously injured by a reckless or distracted driver, Sally Morin is the pedestrian accident lawyer in San Francisco you need to call. She and her team of personal injuries attorneys have been helping injured individuals just like you put the pieces of their lives back together after a crash. Getting the financial compensation you deserve (either in or out of court) can help you get back on your feet, and back to work, faster. To find out if Sally is the best pedestrian accident attorney in San Francisco for you. Submit your details online for a FREE Case Evaluation.